When I first looked at the book, I assumed from its shape and cover that it would be in the style of highly illustrated, two-page spreads with large illustrations and the text little more than captions. In reality, Nicola Temple and Catherine Whitlock manage to subvert that format - it is, indeed, presented as a series of separate two-page spreads, but there is far more text on these than is normally found, and that text effectively flows through the page and from spread to spread - so it's far more like reading a real book. Many of the illustrations, also, are useful, rather than simply pictures for the sake of it. So far, so good. What we've got, in case that isn't obvious, is an exploration of the vast numbers of microbes living inside a human body. There's a shorter first section that describes just what bacteria are and how they function (and the other bits and pieces of microbiota, such as viruses and fungi, though these get far less coverage, as the book's title suggests). We are told what they do for the human body in both positive and negative roles. There are plenty of facts here, and there is the benefit of the text flowing through, though occasionally it looks as if the authors have written text and it has then been split up and plugged into the different components of the page, assuming the reader will follow in a particular order. For example, there's one spread where the second page text begins 'Occasionally, however...' - that 'however' refers to a bit of text embedded in an illustration on the previous page, which the reader won't necessarily have just read. Unfortunately, though, Meet Your Bacteria suffers from the same problem as its predecessors - even more so, in that they did at least have sections where there was narrative. Here, every page is a collection of facts with no real feeling of being told a story. The result is something that reads more like a reference book, or even a secondary school textbook, than it does a popular science title. This is particularly true of the larger second section, which goes through various parts of the body (skin, eyes, mouth, lungs etc. etc.) with spreads on the different bacteria than can occur there and their implications for our health, good or bad. Frankly, it was just dull to read. Because of the 'collection of facts' approach, there were so many missed opportunities to build on a topic with some supporting context to form a narrative. There was nothing to speak of about the people involved in discovering the information provided. There was no context for the facts. To give a couple of small examples, there's an interesting story to be told in the old suggestion there are 10 times as many bacterial cells as human in our bodies - and the subsequent modification of this number to a smaller one. Here we are just told a range of numbers. Again, several times, we are told of the beneficial impact of antioxidants, but there's no discussion of the doubts about consumed (as opposed to produced by the body) antioxidants, or the evidence that some consumed antioxidants can increase cancer risk. There were many other such opportunities. Good science writing is storytelling just as much as good novel writing - and that just isn't happening here. I don't think it's the authors' fault - with a book like this, the format tends to be prescribed by the publisher. 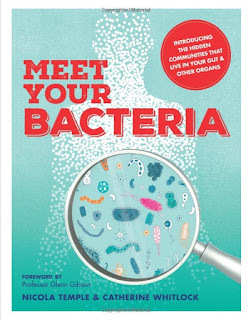 However, if you do want a light reference book on the subject to dip into, rather than read end to end, Meet Your Bacteria has a lot going for it.